After the cliffhanger of book 1 (DREAMS) our hero is poised in a fight in two worlds. In dream world he is fighting the killer known as shady while in the real world his defenceless body is also a target. Will our hero escape the dream world and save his life or will Shady win? Read on dear readers! 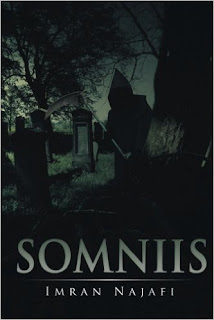 Imran Najafi's SOMNIIS continues where his first book DREAMS left off with our hero (Fenton) trying his best to come to terms with his new found powers. Now that Fenton has realised what he is capable of he now decides to hunt and hopefully kill the person known as Shady, who has been his enemy since the first day he got powers. But therein lies the struggle, what if he kills Shady and something far worse appears? He will have to come to that bridge if and when it appears, but for now he is now been granted a new power that allows him to see the dream world in reality, which would make any sane person go mad. Imran's second book is 46 pages which is double the first book and I also found had more humour then the first book as DREAMS was alot darker. Looks like there is more to the story as much like the first book it ends when you are getting into it. Definitely pick these books up, I mean where else can you read about a talking flying sheep?